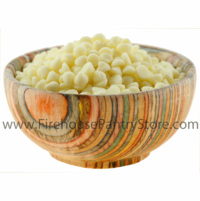 Creamy white "chocolate" baking morsels, a.k.a white confectionery drops, will lend a mild white chocolate flavor to cookies, brownies, fudge, and cakes. Melts smoothly for dipping and coating. Tiny miniature-sized chips (4M - 4,000 drops per pound). Ingredients: sugar, partially hydrogenated palm kernel oil, whey, nonfat milk, mono and diglycerides and soya lecithin emulsifiers, pure vanilla. Contains Milk & Soy. Packaged in a facility that packages wheat, milk, soy, egg, peanuts, and tree nuts. This product is very likely to sustain melting when shipped during warm/hot weather. 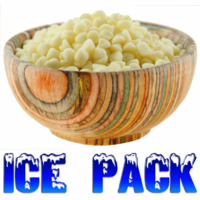 Add ice packs to your order here. Order at your own risk. Firehouse Flavors and the shipping agent will not be responsible for melted products.